Hot on the heels of its groundbreaking predecessor, ROG Strix SCAR II brings you even more power and style for your FPS esports gaming. Boasting the world’s first 144Hz super-narrow-bezel display with an ultrafast 3ms gray-to-gray (GTG) response time for ultra-accurate targeting, Strix SCAR II has no equals! The fast-responding desktop-style keyboard with Overstroke technology ensures precision control of your armory, while the patented RangeBoost multi-antenna system guarantees ultra-reliable, wide-ranging Wi-Fi coverage. To give you an edge in the heat of battle, this powerful Windows 10 Home gaming laptop incorporates a HyperCool Pro thermal system: this delivers the extreme cooling needed to squeeze every last drop of performance out of its 8th Generation Intel® Core™ i7 processor and NVIDIA® GeForce® GTX 10-Series graphics. Upgrade your firepower with Strix SCAR II — it’s the ultimate weapon for the fiercest gunfights! By using a super-narrow-bezel display, there’s less distracting frame, so the chassis dimensions can be reduced to the minimum, making Strix SCAR II narrower than ever without sacrificing precious screen space. A unique rubber frame surrounds the display — this not only protects the display from damage when you close the lid, but also visually enhances the slimness of the bezel for a more immersive feel. Inspired by a bullet homing in on its target, Strix SCAR II features two contrasting brushed finishes that meet to create a dynamic diagonal slash across its lid. The anodized Gunmetal Gray finish and deep-black heatsink mimic the dark feel of an assault rifle — a true reflection of a warfighter’s inner calm, focus, and precision. Kevlar weave and camouflage-inspired markings around and across the keyboard epitomize life on the battlefield. A special eight-step in-mold roller process is used to achieve the unique 3D-weave and color overlays. This technique also results in a smudge-proof surface, ensuring Strix SCAR II stays free of unsightly fingerprint marks. 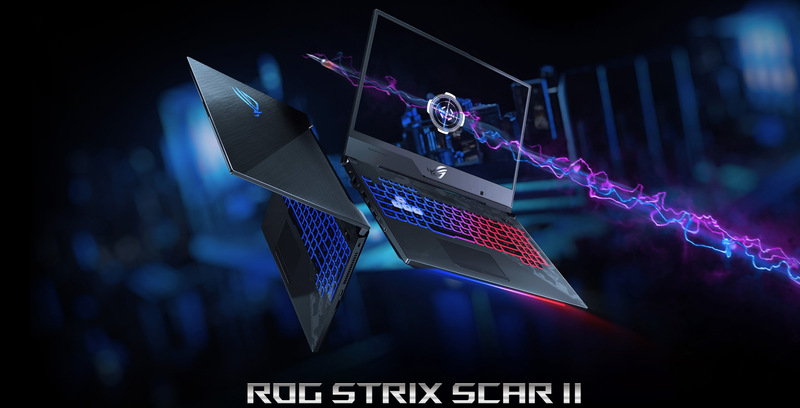 Strix SCAR II is armed to the teeth: it’s powered by up to the latest 8th Generation Intel® Core™ processor with 16GB of DDR4 2666MHz memory, and a choice of either NVIDIA® GeForce® GTX 1060 or GTX 1070 graphics. Storage isn’t an issue, with 256GB M.2 NVMe PCIe® 3.0 x4 SSD and a 1TB Seagate® FireCuda™ SSHD on offer. However you equip your Strix SCAR II, you’re guaranteed combat-proven firepower to rule the game. Strix SCAR II is equipped with the latest 8th Generation Intel Core i7-8750H six-core CPU, providing you 23% more performance over the previous generation. Intel Speed Shift and Turbo Boost technologies push the processor to speeds of up to 4GHz (four-core) and 3.9GHz (six-core) respectively. Intel Hyper-Threading enables up to 12 threads to handle every task quickly and efficiently, including simultaneous gaming, recording, and live-streaming. 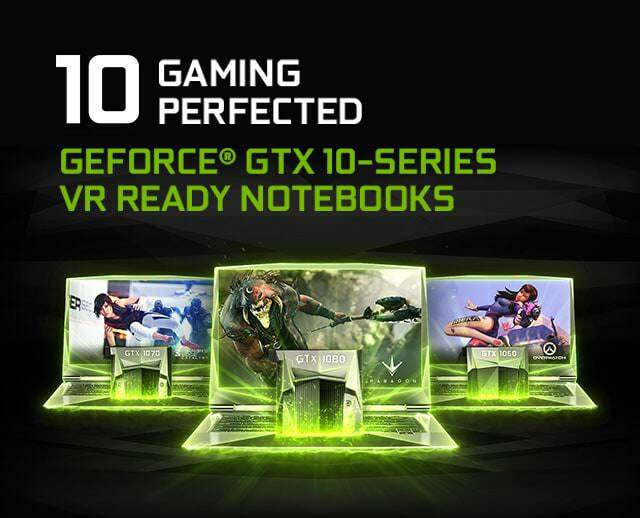 The latest NVIDIA GeForce GTX 10-Series graphics architecture offers the highest possible gaming performance, new gaming technologies, and unmatched VR experiences. Strix SCAR II features NVIDIA GeForce GTX 10-Series GPUs, packed with as many as 2048 CUDA® cores and the highest boost-clock speed of 1645MHz — 1.4x that of the previous generation! 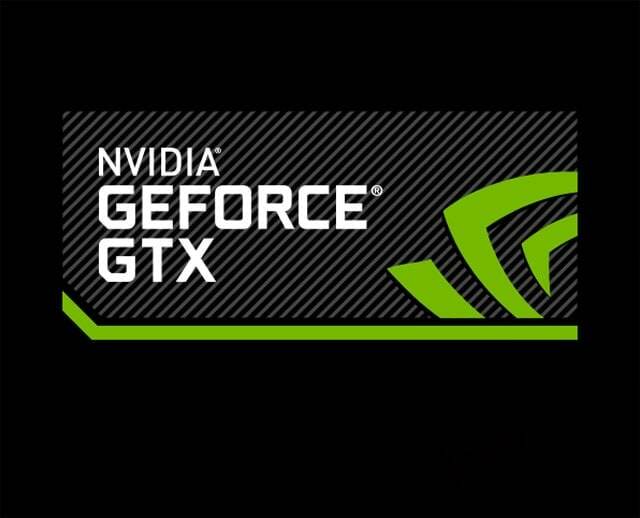 GeForce GTX 10-Series graphic cards also support Microsoft® DirectX® 12, enabling the newest visual effects and rendering techniques for gaming experiences that are more realistic than ever before. With up to 32GB of high-performance DDR4 2666MHz dual-channel RAM, Strix SCAR II has more than enough bandwidth to run the latest games smoothly, while at the same time consuming less energy. Strix SCAR II is fitted with a lightning-fast 512GB M.2 NVMe PCIe® 3.0 x4 SSD. With a potential bandwidth of up to 32Gbps, it offers superfast data-access speeds — so everything you do feels fast and smooth. Used as primary storage or secondary storage to support an SSD, the 5400rpm FireCuda solid-state hybrid drive (SSHD) used in Strix SCAR II loads games in less than half the time taken by 1TB 7200rpm HDDs — and it’s quieter, too. The SSHD takes note of your most frequently used files, and caches them onto its onboard flash memory. Over time, you’ll see a notable difference in loading times as the file access speeds increase. GeForce GTX 10-Series GPUs give you up to the performance of previous-generation GPUs. 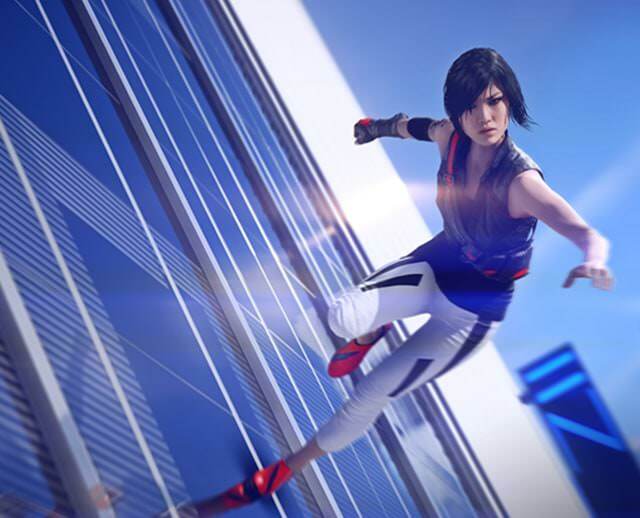 They’re built with ultra-fast FinFET, the latest high-bandwidth memory technologies, and support for DirectX 12 features to deliver the fastest, smoothest gaming notebook experiences. These innovative GPUs were created to meet the demands of next-generation displays, including VR, ultra-high resolution, and multiple monitors. 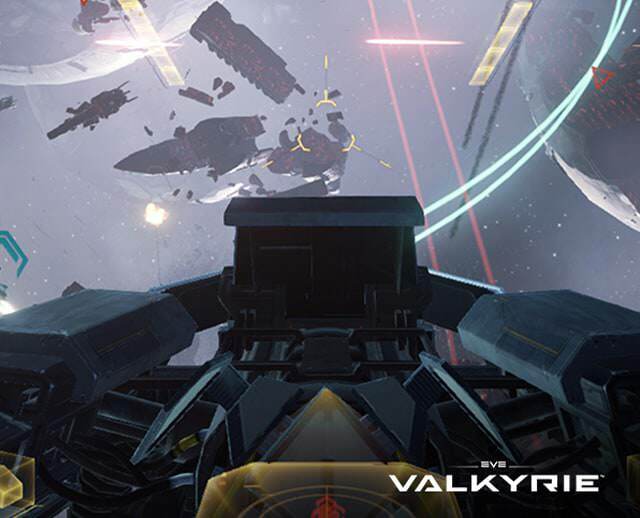 NVIDIA GameWorks technologies give you extremely smooth, cinematic gameplay, plus revolutionary NVIDIA Ansel™ that lets you capture 360-degree in-game images and view them in VR. Discover next-generation VR performance, the lowest latency, and plug-and-play compatibility with leading headsets — driven by NVIDIA VRWorks™ technologies. VR audio, physics, and haptics let you hear and feel every moment. Strix SCAR II has two upgraded high-performance fans with 71 liquid-crystal-polymer (LCP) fan blades — 20% more than its predecessor — for improved cooling. Compared to regular 5V fans, they spin 20% faster, improve airflow by up to 42.5%, and increase air pressure by up to 92%. The unique heat-pipe design includes an extended cladding plate that soaks up heat from the CPU and GPU, and distributes it evenly to avoid thermal throttling. This keeps chipset power components below 90°C — increasing system reliability and lifespan. The Anti-Dust Cooling system is a patented centrifugal fan module with two anti-dust tunnels. It works on the principle of centrifugal force, which acts on any object moving in a circular path, pushing it away from the center from which it is moving. Dust particles and dirt in the fan module are blown along the fan walls, and eventually expelled out of the chassis through the anti-dust tunnels. This prevents buildup on the heatsink fins and improves dust removal rate by an astounding 240%! Dust accumulation on the heatsink often results in compromised cooling performance. The Anti-Dust Cooling system delivers the cooling Strix SCAR II requires for heated gaming marathons. Fan noise also decreases since the fans aren’t overworked. The special copper cooling fins used in Strix Scar II are just 0.1mm thin — half the thickness of regular fins. Narrower fins allow for more of them to be used in the cooling module; this increases the surface area for heat dissipation by up to 10%, while at the same time reducing air resistance by 7%. When opened, normal laptop lids block airflow out the back which could, in some instances, cause overheating. The innovative and patented trapezoid-cut on Strix Scar II avoids this problem, and improves thermal efficiency by up to 27% over traditional designs. While the dynamic fans automatically adjust their speed according to CPU and GPU temperatures, you can select different modes to suit the situation at hand. Fan Overboost is the most aggressive setting, with the fastest fan speed to fully exploit the power of Strix SCAR II. Silent mode lowers the fan speed, ideal when you’re after some peace and quiet. A single press of the function key (Fn+F5) lets you quickly and easily regulate fan performance to control noise levels; it can also be accessed through ROG Gaming Center. ROG Strix gaming laptops are the first in the world to feature multi-antenna Wi-Fi for 30% more range, higher Wi-Fi throughput, and fewer connection drops. Patented ROG RangeBoost technology combines four antennas located at the back and front of the machine with a unique algorithm that constantly scans and selects the best pair of antennas able to cover each other’s dead spots, resulting in the strongest possible signal. The latest 802.11ac Wave 2 Wi-Fi standard delivers speeds of up to 1.7Gbps — twice that of 802.11ac 2×2 and 12x that of 802.11b/g/n! A revised keyboard with HyperStrike Pro technology puts decisive control at your fingertips. It features a desktop-inspired layout, four hotkeys, customizable RGB backlighting across four zones, a highlighted WASD key group with transparent key caps, and ergonomic 0.25mm-deep keycap curves for more comfortable typing. Exclusive ROG Overstroke technology enables earlier key actuation and a longer over-stroke distance for fast, accurate and effortless keystrokes that increase your actions per minute. N-key rollover technology ensures multiple simultaneous keystrokes are instantly logged, while anti-ghosting ensures no false commands are registered — so you’re in full control when precision is needed. With a lifespan of 20 million key presses, SCAR II has one of the most durable keyboards to be found in a laptop — double that of the current industry standard. The new layout follows the design of the best desktop-gaming keyboards. That means the entire keyboard module is now designed for the way your fingers are used to playing, with gaps between the function keys for easier identification (1), and isolated arrow keys for the most accurate fingertip control (2). The Space bar has also been extended and reshaped for more comfort and fewer misses (3) — giving you the most accurate fingertip control. ROG Overstroke technology ensures each key is perfectly calibrated to require just 62 gram-force (gf) for actuation. Keystrokes are registered early, accurately and with extended over-stroke distance — and that means faster and smoother control. Four gaming hotkeys sit isolated above the keyboard for quick access to the volume and mic mute controls, and the ROG Gaming Center. They’re carefully spaced to avoid accidental presses, and feature unique keycaps for easy identification by touch. Beneath them sits a full array of secondary function keys (F1 to F12). They’re strategically placed and grouped in fours, so you’ll intuitively know where each key is so you can stay focused on the action.